We all like ice creams!! Isn’t it!! Ice creams come in different flavors – for example, strawberry ice cream, mango ice cream etc. Ice creams have always been in demand all over the world. And now Durian fruit ice cream is gaining popularity. In view of the same, the manufacturers are trying to capture the Global Market. Durian is not native to India, but it is slowly gaining a presence among local fruits. It is revealed from the traditional plant and fruit-based old Dadi-Nani nuskhe that durian is effective at treating infertility, giving hope to all those childless couples and sending the price of durian in India, both imported and homegrown, skyrocketing. Most durian in India is scattered helter-skelter along the backwaters of Kerala and the mountains of Tamil Nadu left 100 years ago by Indians returning home from working in the rubber fields in Malaysia. It’s hard to find – a perfect durian hunt. Durian fruit is generally slightly oval, about a foot wide and covered in formidable looking spikes. The fruit can weigh between 2-7 pounds, and this is heavy enough that in holding it in your hands by the body of the fruit, instead of the stem, it could potentially pierce the skin. However, its otherworldly appearance is dwarfed by another one of its attributes – the smell. Durians have a strong, rank smell that permeates the outer shell and lingers long after the fruit has been removed. Despite the stench, durian is extremely healthy, even more so than many other fruits. Naturally rich in iron, vitamin C, and potassium, durian improves muscle strength, skin health and even lowers blood pressure. Furthermore, one small durian contains 23g of dietary fiber which is nearly all daily nutritional requirements. However, it is important to not eat them in excess, as in 2010 Malaysian politician Ahmad Lai Bujang was rushed to hospital complaining of breathlessness and dizziness after gorging himself on durian. The fruit changes significantly over a very short period of time. When it is harvested early, it is almost considered a vegetable because the flesh is hard, easy to handle and bitter, rather than than sweet. People who enjoy eating durian usually prefer the fruit to be over-ripened, when the citrus and sweet flavors are much more prominent. Traditionally, durians are eaten after they have fallen to the ground on their own accord; however, durian farms often harvest the fruit earlier in order to ship them overseas. There are around 30 different varieties of durian. The fruit is native to Malaysia, Indonesia  and Borneo however today there are durian farms in Sri Lanka, Southern India, Cambodia, Vietnam, Thailand and the southern Chinese island Hainan. Thailand is, in fact, the biggest exporter of the fruit and home to many durian farms which produce more varieties than the original native locations. 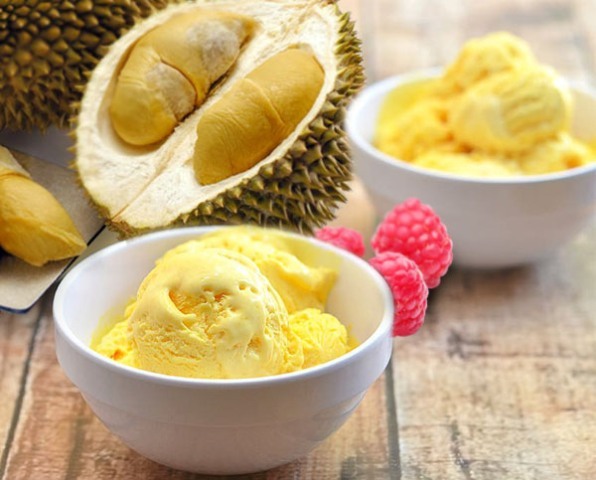 Durian ice cream, a favorite of many people in Singapore, South Korea, Australia or Japan has its basic ingredient in fact exported from North Sumatra. North Sumatra Crop and Horticulture Agency program subdivision head Yusfahri confirmed that at least 10 countries -Japan, South Korea, China, Thailand, Malaysia, Vietnam, Singapore, the Philippines, Australia, and Brazil -routinely imported durians from the province in the last seven years. Malaysia imports the biggest volume of durians, followed by Japan, Vietnam, Brazil and Thailand. The data from 2017 show that Malaysia imported 901.21 kilograms of durians, Japan imported 480.17 kg, Vietnam 371.90 kg, Brazil 284.20 kg and Thailand 240.60 kg. Yusfahri said the exported durians were already processed because most of them would be manufactured into ice cream. He said many more Asian countries, as well as those in South America, had expressed their interest in importing durians from North Sumatra, yet as the supply was limited the province so far could only meet the demand from these 10 countries.